Arnold Richardson has had his eye on Adapt-N since 2009, when the tool for weather-adapted sidedress nitrogen recommendations first became available. Of a self-described “competitive nature,” the Red Creek, NY farmer is constantly seeking and testing new strategies that can improve his farm system and boost yields and profits. 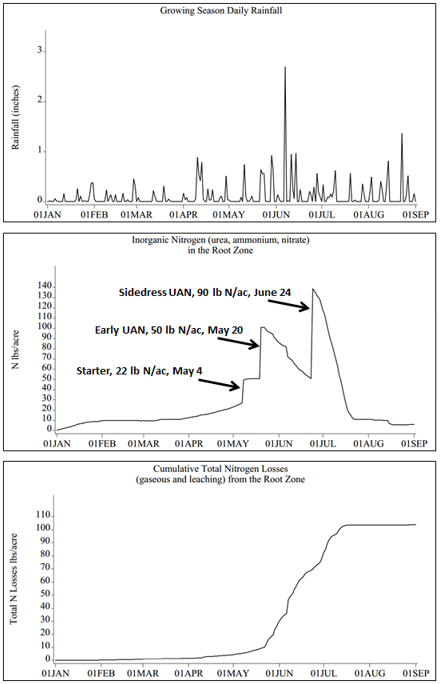 After several years of watching the development of Adapt-N and its success in early on-farm trials, Richardson conducted strip trials of the Cornell nitrogen management tool in three fields in 2013. All three trials increased his yield and profit, and of course, got him thinking about what improvements to make next. The Richardson Farm crew (left to right): Arnold, Eric, and Ryan Richardson and Nick Humphrey. Richardson and sons grow grain corn and soybean on 1000 acres near the border of Cayuga and Wayne counties. The mix of rich river bottom loams and stony clay drumlins in their fields requires flexibility and ingenuity in management. The team has significantly changed management practices since inheriting the farm several decades ago. They switched from continuous corn to a corn-soybean rotation, which gave an immediate 20 bu/ac yield bump on corn, says Arnold. They’ve also experimented with various primary tillage tools, switching from moldboard to chisel plow in 1983, then testing strip till, aerator, and most recently “vertical tillage” tools over several years to see what works best in their system. Most recently, the farm’s experiments have included increased seeding rates and a review of their nitrogen management practices. The Richardsons have long taken a weather-conscious approach to nitrogen management decisions, applying most N as sidedress to better match the timing of crop uptake. “That’s the best time,” says Arnold. “The corn is making big decisions about its future at the 5 – 8 collar stage. We try to help it make good decisions… We’ve got to keep the corn happy all the way through.” They follow a general rule of 1 lb N per 1 bushel expected yield, adjusting for N use efficiency and soybean credits, for an average of around 150 lb N per acre per year over the whole farm. Understanding that weather influences N dynamics, the Richardsons even split their N into earlier and later sidedress applications on sandier fields, to minimize the risk of leaching losses with rain. They ran a few Adapt-N simulations in previous years, usually coming up with recommendations that were lower than or similar to their own rates. However, they had not adjusted their total N rates based on weather until they tested Adapt-N in the field last year. Keith Severson of Cayuga County Cooperative Extension guided the Richardsons in establishing three Adapt-N strip trials in 2013. The trials were conducted in corn grain following soybean, on Williamson and Ontario silt loams with 2.6% to 3.8% organic matter. All trials received 22 lb N/ac in starter, following the farm’s normal practice. The third trial also received an extra 50 lb N/ac in May, because Richardson wanted to test a practice more similar to that of his neighbors, who apply more of their nitrogen early. Two treatments, replicated four times, were implemented in late June to compare Adapt-N-recommended and Grower-chosen sidedress rates. Due to the unusually wet spring, N leaching and denitrification losses (simulated by Adapt-N) were high. Adapt-N thus recommended sidedress rates 20, 30, and 40 lb/N higher than Richardson’s chosen rates. Yields increased significantly with the higher N rates in all three trials, with gains of 23 to 30 bu/ac. At Richardson’s actual prices ($0.75/lb N and $5.00/bu corn), this translates to profit gains of $91/ac to $122/ac from the use of Adapt-N. Total yields in the trial strips ranged from 162 to 222 bu/ac. As well as implementing the trials, Richardson also followed Adapt-N recommendations on the rest of the farm’s acres, “which resulted in a larger N bill than originally planned, but with a pleasing result yield wise,” he says. One Adapt-N trial plot earned the farm fourth place in the Finger Lakes section of New York State Corn and Soybean Growers’ Association 2013 Yield Contest, at 232 bu/ac. Richardson’s experience was typical of Adapt-N trials in New York last season. In 8 out of 11 NY 2013 trials, Adapt-N increased N rates over grower practice. Across all trials, growers saw their yields increase by an average of 21 bu/ac with Adapt-N rates 20 lb/ac higher than grower-chosen rates, resulting in profit gains of $94/ac (10:1 price ratio, silage reported as grain equivalent). Adapt-N was able to adjust N rates upward by using site-specific high resolution climate data to simulate the year’s unusually wet spring conditions, and the resulting large leaching and denitrification losses of early-applied fertilizer and early-mineralized organic N. By contrast, in the more normal springs of 2011-2012, Adapt-N simulations were able to correctly identify higher N availability from the same sources. In 56 trials in these years, New York growers gained $31/ac on average by cutting back on 66 lb/ac of unnecessary N applications. While yield and profit gains are a convincing incentive for the Richardsons to continue to use Adapt-N, the value of Adapt-N runs deeper than just financial on the Richardson farm. Arnold and sons were struck by the tool’s graphs of soil N availability and rainfall, which clearly showed the farm’s weather-related early N losses. Arnold has also “gotten into these what-if scenarios quite a bit,” regularly using his Adapt-N account to play with different management schemes and retrospective simulations. Graphic output from Adapt-N, showing rainfall, root-zone inorganic nitrogen, and cumulative N losses in one of Richardson’s trials. The large early-season losses are typical of a wet spring. For more information: An in-depth 2014 training webinar on Adapt-N, manual, and further information are available at http://adapt-n.cals.cornell.edu/. The Adapt-N tool can be used from any device with internet access, and as of the 2014 sidedress season is offered through a public-private partnership between Cornell University and Agronomic Technology Corporation for a fee ($1-3/ac, depending on area covered). Users can sign up for an account at http://www.adapt-n.com/products/, and can elect to receive email and/or cell phone alerts providing daily updates on N recommendations and soil N and water status for each management unit being simulated in Adapt-N.